PCR amplification of target molecules involves sequence specific primers that flank the region to be amplified. While this technique is generally routine, its applicability may not be sufficient to generate a desired target molecule from two separate regions involving intron /exon boundaries. For these situations, the generation of full-length complementary DNAs from two partial genomic clones becomes necessary for the family of low abundance genes. The first approach we used for the isolation of full-length cDNA from two known genomic clones of Hox genes was based on fusion PCR. Here we describe a simple and efficient method of amplification for homeobox D13 (HOXD13) full length cDNA from two partial genomic clones. Specific 5' and 3' untranslated region (UTR) primer pairs and website program (primer3_www.cgv0.2) were key steps involved in this process. We have devised a simple, rapid and easy method for generating cDNA clone from genomic sequences. The full length HOXD13 clone (1.1 kb) generated with this technique was confirmed by sequence analysis. This simple approach can be utilized to generate full-length cDNA clones from available partial genomic sequences. The first approach we used for the isolation of full length cDNA from two known genomic clones of Hox genes was based on fusion PCR (1). It involved selection of primers at the 5' and 3' ends of the two exons with a complimentary set of primers in the middle of the clone. This approach was time consuming and labor intensive, especially with the number of different combinations of primer pair sets and series of PCR amplifications. We were successful in generating the 3' half of the clone with this procedure, but the high GC content in the 5' end of the clone proved to be a challenge with this strategy. To circumvent this problem, we used 5'-RACE (Rapid amplification of cDNA ends) procedure to generate 5'-end of the clone (3). This method involved use of many more specific primers, nested gene-specific primers, followed by PCR amplifications of homopolymer-containing anchor/adaptor priming steps. While considerably more efficient than fusion PCR, this technique was still unable to generate the specific high GC rich 5' end of our gene of interest i.e., the homeobox D13 cDNA (4). Here we describe a novel and efficient PCR-based method for the generation of full length cDNA of low abundance transcripts from two partial genomic clones. Our approach took advantage of three aspects: 1) selection of the two exons from two individual clones without intervening intron sequences, 2) generation of a contiguous sequence representing the potential full length cDNA sequence having both 5' and 3' untranslated regions (UTR) and 3) utilizing the website program(primer3_www.cgiv0.2) (6) to design specific primers within 5' and 3' UTRs to generate a full length cDNA clone of about 2 kb (fig. 1). Schematic representation of the full length cDNA generation from two partial genomic clone sequences. UTR: 5' and 3' untranslated sequences, DF1: HOXD13 forward primer 1 and DR2: HOXD13 reverse primer 2. A major advantage of this technique is the species sub-group specificity provided by the 5' end primer used in the amplification. However, inorder to increase total cDNA random hexamers can be used. The specificity permits the amplification of a particular clone in the presence of other closely related gene family members. We have applied this technique to prepare a full length homeobox D13 cDNA clone from two genomic clones isolated by Goodman and coworkers (4). Total RNA was extracted from A549 cells using Trizol method as per the instructions of the manufacturer (MRC, Cincinnati, OH) (5). According to the manufacturer RNA isolated by this method is devoid of protein, carbohydrate and to a large extent genomic DNA contamination. RNA concentration was measured using Beckman DU-64 spectrophotometer. RNA purity and integrity was checked on a agarose gel for 28S and 18S ribosomal bands. For cDNA production, 3 μg of RNA was incubated with 20U of RNase-free DNase, followed by reverse transcriptase reaction with oligo dT primers and the Superscript Preamplification System Kit (BRL, Life Sciences, Grand Island, NY). The reaction mixture contained: 1 μl of primers; 2 μl 10X PCR buffer; 2 μl of 25 mM MgCl2; 1 μl of dNTP (nucleotide triphosphate) mix provided in kit; 2 μl of 0.1 M DTT (dithiothritol); 1 μl of RNase-free DNase; and 1 μl of RNase inhibitor (all provided in kit). The mixture was incubated at 37°C for 30 min, then the DNase was inactivated by incubating at 95°C for 5 min. Following 10 min on ice, 1 μl of reverse transcriptase II was added to the mixture, and using a thermocycler, the mixture was incubated sequentially at 42°C for 50 min, and then 70°C for 15 min. The cDNA preparation was stored at -20°C until used. We further purified our cDNA preparation using GlassMAX spin cartridge (Gibco BRL Life Technologies, Rockville, MD) which proved to be a useful step in generating a full length clone. Factors contributing to the generation of long cDNA's are i) the concentration, purity and integrity of RNA ii) the use of random hexamers as opposed to oligo-dT for priming cDNA synthesis. Five μg of purified cDNA was amplified by PCR using primers that spanned the intronic sequences of the two clones. A negative control comprising water instead of RNA has been used to monitor possible contamination. The most suitable PCR amplification conditions were determined for each set of primers by an on-line primer design program (primer3_www.cgiv0.2) (6). Five percent DMSO was incorporated into the PCR buffer because of the high GC content in the 5' region of the clone. The primers, fingerprinting endonucleases, and the cycling conditions are shown in Table 1. Each 50 μl PCR reaction consisted of 34 μl H2O, 5 μl 10X buffer, 2.5 μl DMSO, 2 μl of each primer 50 pmol, 4 μl of 10 mM dNTPs, 2 μl of cDNA, and 0.5 μl of Taq polymerase. The PCR products were electrophoresed through 1.0% agarose gel. The intensity of the ethidium bromide stained bands was measured by Eagle Eye II image analyser (Stratagene, Inc. USA). Each experment was normalized to B-actin signal as an internal control. Negative controls were PCR reactions without template cDNA. The PCR products were also sequenced to confirm that reaction amplified the expected full length HOXD13 sequence of 1.1 kb. Total RNA (3 μg) was denatured together with oligo-dT primer (10 pmol) for 15 min at 68°C. After 5 min incubation on ice, poly-adenosine (poly-A) RNA was reverse-transcribed at 42°C for 90 min in RT solution (50 mM Tris-HCl, pH 8.3; 40 mM potassium chloride; 8 mM magnesium chloride; 0.5 mM each dNTP; 225 ug/ml bovine serum albumin; 5 mM dithiothreitol; 20 units Rnasin and 200 U superscript (Gibco-BRL, Gaithersberg, MD, USA)). The cDNA was incubated at 95°C for 5 min to inactivate the reverse transcriptase, and served as the template for PCR amplification. Sequence information in the genomic clones have been used to generate the PCR primers. The most suitable PCR amplification conditions were determined for each set of primers by on line primer design program (primer3). PCR was performed after adding 80 ul of PCR mixture (50 mM each dNTP; 50 pmol of each sense and the antisense primer; 2.5 units of Taq polymerase (Perkin-Elmer, USA). A full length homeobox D13 1.1 Kb cDNA was generated by DF1 (HoxD13 forward primer1) and DR2 (HoxD13 reverse primer2) primers using genomic clone sequences as shown in fig 1. 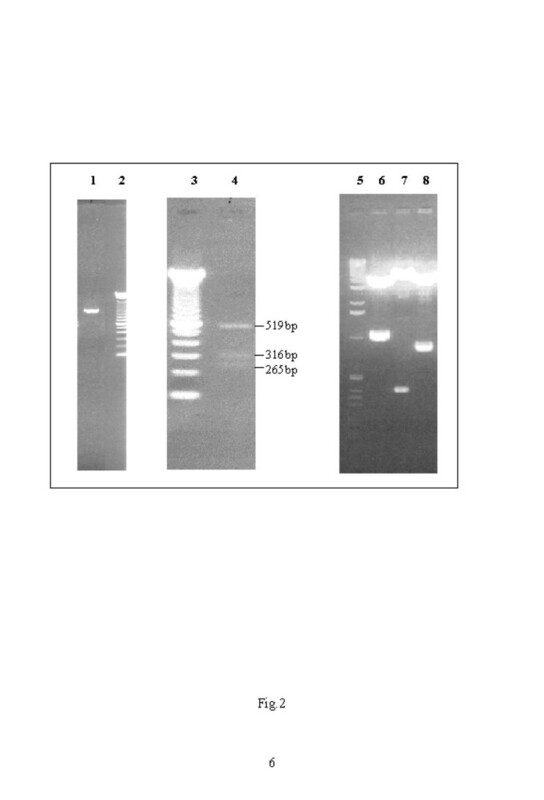 Restriction endonuclease digestion of this PCR product with Ppum 1 showed correct expected size fragments of 519, 316 and 265 bps respectively. 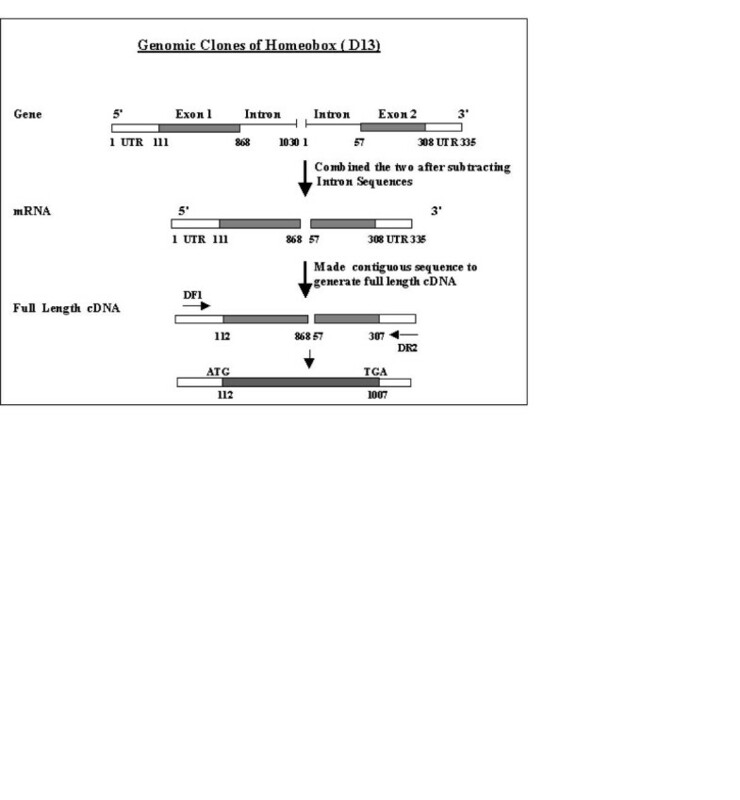 The full length D13 clone in PCR®II vector (Invitrogen) was digested with three restriction endonucleases that resulted in correct expected fragment size pattern as shown in fig 2. Furthermore, we sequenced this D13 clone using T7 primers to ascertain the correct open reading frame for this gene. No mutations were observed in D13 cDNA as a consequence of PCR manipulation. Full length HOXD13 cDNA PCR product analysis. 1) 1.1 kb full length homeobox D13 cDNA generated by using DF1 and DR2 specific primers. 2 and 3) 100 bp ladder (Gibco BRL Life Technologies, Rockville, MD) 4). Restriction endonuclease digestion of PCR product with Ppum 1 showing correct expected size fragments of 519, 316 and 265 bps. respectively 5). 1 kb ladder (Gibco BRL Life Technologies, Rockville, MD) 6-8). are restriction digestion fragments of full length HOXD13 cloned in PCR II (vector) with Eco R1 (1.1 kb), Kpn 1 (381 bp) and Sma 1 and Bam H1 (826 bp) respectively. In summary, we have developed a simple, rapid and easy to perform PCR-based procedure to generate full length cDNA clone from two partial genomic clones. Although we have demonstrated the use of the technique by preparing a full length HoxD13 cDNA clone, the procedure could be easily adapted to other complex subsets of low abundance genes. A major advantage of this method over existing ones is its simplicity, specificity and precision, which eliminates the need for several intermediate enzymes and steps to generate a full length clone. This work was supported in part by VA merit review award to Harvey I. Pass and Institutional American Cancer Society grant award to Anil Wali.